My Transition Ritual Set was born of my own life and creative processes. I created these tools to help you navigate through major changes because the ingredients alone helped me immensely in the past. Change is natural, but it’s always difficult, no matter what kind of transition you face. I believe in the healing power of oils and candle magic. Their ability to raise the vibration around fear and anxiety are subtle, yet potent. This set was designed to help you heal old wounds, anticipate future change, and hold space for peace and happiness. So much of our lives depend on pivotal transition points. It’s not just the path you choose that matters, but HOW you walk that path. Grace or panic? Fear or contentment? Allow these tools to help you react positively to whatever life may bring. 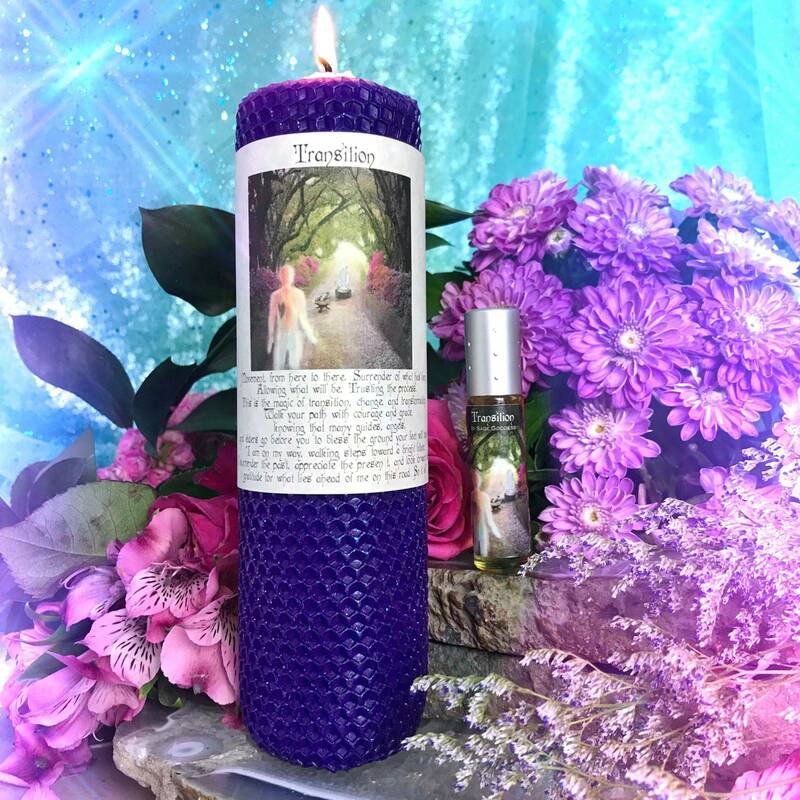 First, you will receive a hand-rolled beeswax Transition Ritual Candle (about 8″) which features the FIRST ever original Sage Goddess artwork, created by my team especially for this candle. It features a spirit walking a path of gemstones and white sage, proceeding toward his or her destiny. 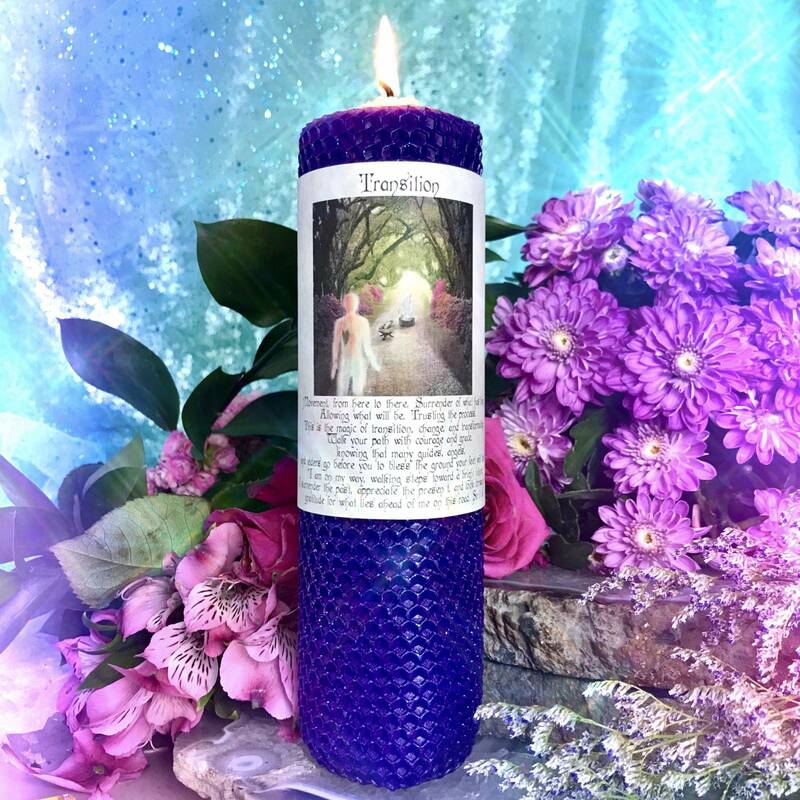 We call it “Unfolding” and this candle, Transition, is about navigating the magical unfoldings of your life with grace. 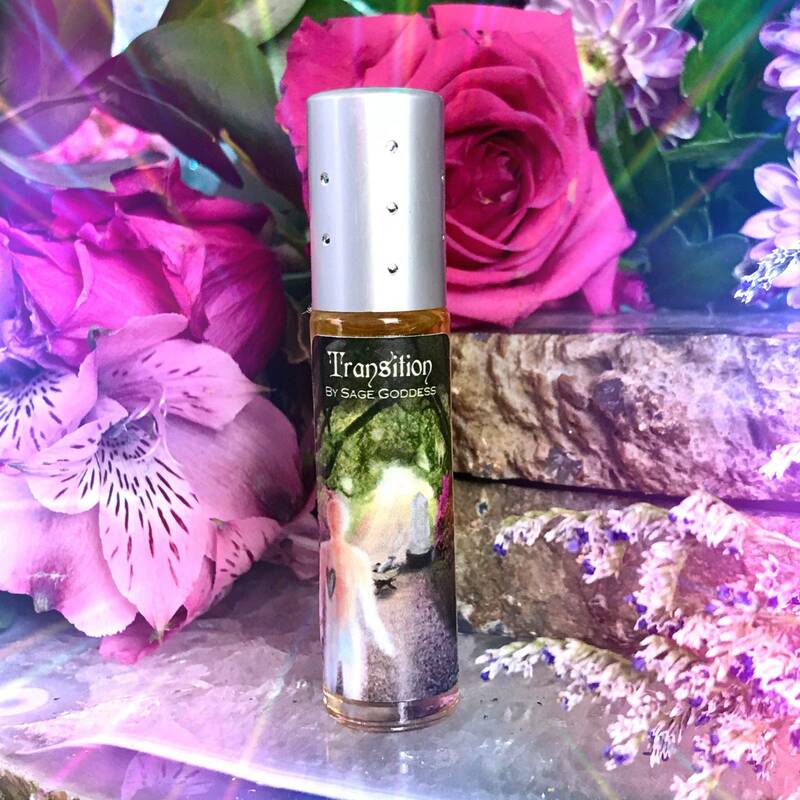 Then, you will receive a 10 ml bottle of my Transition Perfume, a deep and comforting blend of 9 essential oils and absolutes that you will absolutely adore, including vetiver, raw amber, patchouli, benzoin, and Jordanian copal. This blend is grounding, protective, powerful, and yet subtle enough that you can choose to wear it as your daily perfume if you desire. Especially during change. May these tools bless you all year long as you walk your path, and when transition comes, may you face it gracefully. Note: This product is made with natural essential and carrier oils, and may contain fragrance oils. Cap color, chip stone, and color may vary slightly. For external use only. Please always burn the candle on a heatproof stable surface, and never leave a burning candle unattended. This listing is for one (1) Transition Ritual Set. You also have the option of purchasing my Transition Candle or my Transition Perfume by itself. Use the drop-down menu to choose the offering you feel called to. Yours will arrive lovingly parceled for your enjoyment.